Nerve pain in the hand is a common complaint for clients but can also be an occupational challenge for massage practitioners. The most common cause of nerve compression symptoms in the upper extremity is carpal tunnel syndrome. However, other upper extremity nerve compression problems exist and are frequently overshadowed by it. One such problem that warrants more attention is compression of the ulnar nerve in the posterior elbow region. This is a condition known as cubital tunnel syndrome. Surprisingly, this condition is not discussed very often in massage therapy literature, yet it is the second most common upper extremity entrapment neuropathy; second only to carpal tunnel syndrome. If you or one of your clients are experiencing neurological sensations in the hand, it’s crucial to not make assumptions and explore the symptoms more thoroughly. The cubital tunnel is located where the ulnar nerve passes between the medial epicondyle of the humerus and the olecranon process of the ulna (Image 1). There is a small groove or sulcus created between these two prominent bony landmarks and this depression makes up the floor of the cubital tunnel. 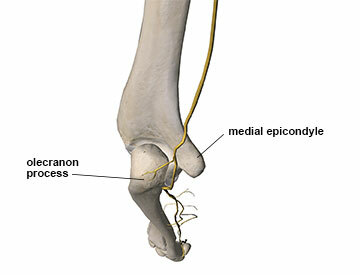 There is a ligament connecting the medial epicondyle to the olecranon, which forms the roof of the tunnel. As the nerve exits this space between these two bony prominences, it passes through another narrow canal between the two heads of the flexor carpi ulnaris (FCU) muscle. One head of the FCU blends with the flexor tendon attachments at the medial epicondyle of the humerus, while the other head originates on the medial aspect of the olecranon process (Image 2). The description of cubital tunnel syndrome can include nerve compression in the tunnel between the two bony prominences as well as compression between the two heads of the FCU muscle. The mechanics of the elbow joint also pose significant challenges for this nerve. During elbow flexion there is movement between the ulna and humerus that actually decreases the size of the cubital tunnel. Space within the tunnel can decrease as much as 55% during elbow flexion, making nerve compression during elbow flexion movements much more likely.2 If the individual has a small or shallow tunnel to begin with, this space decrease becomes even more important as a potential causative factor. Many of us have experienced ulnar nerve compression. The most common occurrence is by holding your elbow bent during sleep, which is a common position. Many people wake up and say their hand has gone to sleep because prolonged elbow flexion and subsequent tunnel narrowing has caused ulnar nerve compression symptoms. There is another important biomechanical consideration occurring during elbow flexion. Not only is the space in the cubital tunnel decreased, but the ulnar nerve is pulled taut and bowstrung across the posterior side of the elbow (Image 3). This position increases compressive forces on the nerve as its diameter is narrowed from stretch the same way the diameter of a rubber tube is decreased when you stretch it from both ends. So the nerve is both stretched and compressed during elbow flexion and this can be a recipe for symptoms. 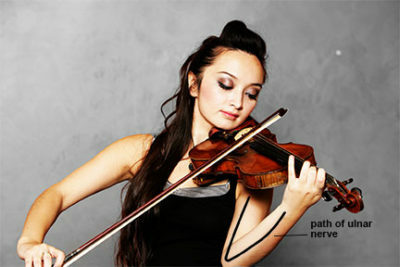 There are other biomechanical challenges as well. Usually the nerve is secured in the tunnel by the bony borders. However, in some cases due to a very narrow tunnel or missing structures that restrain its movement, the nerve can pop out of the cubital tunnel during certain elbow movements. This is referred to as a subluxing nerve and it is very likely to cause nerve pathology symptoms. Cubital tunnel syndrome develops from either acute or chronic compression at the elbow. While it is possible to have acute trauma causing ulnar nerve compression, the more common cause is chronic nerve compression over time due to anatomical or biomechanical factors. It is also more common for cubital tunnel compression to occur in men although the reason for this is unclear. Observe the client’s upper extremity in a neutral standing position. In some cases excessive cubital valgus can contribute to ulnar nerve pathology in the elbow. A valgus angulation is one in which the distal end of a bony segment angles in a lateral direction. In this instance the distal radius and ulna deviate in a lateral direction and this is called cubital valgus (Image 4). However just because a person has cubital valgus, doesn’t mean they will ever develop ulnar nerve pathology. It is simply one piece of the puzzle to consider. Another factor to consider with upper extremity nerve pathology is double (or multiple) crush phenomenon with the nerves, which is defined as two or more locations where a nerve is compressed and signals are impaired. When more than one location is involved, the nerve becomes increasingly sensitive and more susceptible to symptom presentation. For example, if there is compression on the ulnar nerve branch of the brachial plexus near the thoracic outlet region, it will take less pressure in the cubital tunnel to cause symptoms to appear. Client history is very important in uncovering the presence of ulnar nerve compression in the cubital tunnel. Determine if there is repeated upper extremity use, especially elbow flexion either repeatedly or prolonged holding. Also important is identifying external compression on the posterior elbow that may aggravate symptoms. For example if a person’s occupation requires long periods of leaning on elbows, ulnar nerve compression may result from both elbow flexion and external compression on the nerve. The ulnar nerve carries a large number of sensory fibers. Therefore, nerve compression may produce common sensory symptoms such as pain, paresthesia, or numbness. 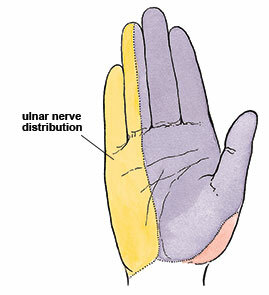 The symptoms will usually be felt in the hand where the ulnar nerve provides sensory innervation (Image 5). Symptoms can also be felt along the forearm, but are more common in the hand. The motor fibers in the ulnar nerve can be affected as well. Sensory symptoms generally appear first, but if the condition is more severe, motor symptoms such as atrophy or weakness may occur later. Image 6: Schematic representation of motor and sensory nerve distribution in a cross section of the ulnar nerve at the elbow. 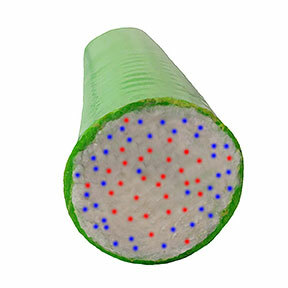 Sensory (blue) fibers are more concentrated around the periphery and motor (red) fibers are more concentrated in the center. Because pressure will be experienced first on the outer periphery of the nerve, those sensory fibers that are most superficial and closest to the edge are the ones affected by compression first. Some of the motor fibers that innervate the adductor pollicis muscle in the hand are also closer to the periphery of the nerve. As a result atrophy and weakness in this muscle can often occur at the same time as the increased sensory symptoms in the hand. The adductor pollicis muscle makes up part of the fleshy bundle of muscles on the thenar eminence of the hand. When this muscle is not getting adequate nerve supply there may be apparent atrophy or even a concave appearance to this portion of the hand. A comprehensive picture established through detailed clinical history and physical examination methods mentioned previously is essential for recognizing this problem. Another method that can be used to investigate the possibility of nerve compression in this region is the upper limb neurodynamic test #4 (Image 7). In this procedure the upper limb is put in a position that places the greatest amount of tensile (pulling) stress on the ulnar nerve. If symptoms are increased with this position, there is an increased likelihood of ulnar nerve involvement somewhere along its path. Gently palpating the area on the posterior side of the elbow while the client is in this position may reveal increased sensitivity and reproduction of symptoms. That response would strengthen suspicion of ulnar nerve compression in the posterior elbow region. When a nerve is compressed, it often develops an increased degree of sensitivity. Consequently, it is a bad idea to do anything that further aggravates the nerve compression symptoms. Soft-tissue treatment in the region of the cubital tunnel where the nerve is very superficial could easily aggravate symptoms and prolong the condition. It is also a good idea to avoid deep compressive work near the proximal attachment sites of the flexor tendons near the medial epicondyle, as this is where the ulnar nerve may be compressed between adjacent muscle structures. However, just because the nerve may be compressed in this region does not mean that massage is contraindicated. 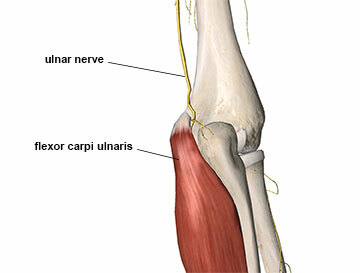 Tightness throughout the flexor muscles of the forearm, and especially flexor carpi ulnaris, can play a role in aggravating nerve compression problems. In this case working the wrist and hand flexor muscles in the forearm can be beneficial as long as it does not produce neurological sensations. It may be advantageous to work lightly around the elbow and reserve other more specific and deep pressure applications for the middle and distal portion of the forearm. Nerve compression problems are notoriously slow to heal. The most important factor in addressing the detrimental effects of nerve compression is to get pressure off the nerve and allow that tissue time to heal appropriately. Consequently any alterations in activity or aggravating factors that can be reduced outside of the treatment room will be a key component of successful resolution. It is helpful to treat the entire path of the ulnar nerve from the cervical region all the way through the distal end of the upper extremity. Treatment in other areas that may reduce nerve irritation can play a very important role in resolving symptoms. Decreasing pain and neural excitability with massage should be encouraged. Nerve compression disorders can become more problematic and spread to other areas because of the constant bombardment of noxious irritation signals from the problem region. Massage works powerfully in producing positive and pleasurable neurological sensations and these can interrupt the cycle of perpetual noxious impulses that lead to pain. Breaking this cycle is an important part of resolving many nerve pathologies. Conservative treatment approaches are usually tried first and in most cases they will be successful. If conservative treatment is not successful there are surgical approaches that are sometimes used to address this problem. However, many of the surgeries used to treat cubital tunnel syndrome also create biomechanical challenges that can lead to further injury down the road. One of the more common surgical approaches is to move the ulnar nerve so it is not sitting in the tunnel but is actually to the (medial) side of the humeral epicondyle. Repositioning the nerve does decrease the tensile pull on the nerve during elbow flexion. However, it also brings the nerve more superficial and exposes it to increased external compressive forces on the medial side of the elbow. A study evaluating the results of nerve transposition reported a very interesting finding. They noted that in a large percentage of the patients that had undergone nerve transposition surgery, the nerve had actually increased in diameter once it had been moved.4 The increased size of the nerve will make it more susceptible to pressure against adjacent structures. Numerous occupations and recreational activities involve repetitive or prolonged upper extremity positions that may lead to ulnar nerve compression. Notably, this condition is an occupational injury that can affect the massage professional. To avoid surgery, clients are likely to seek out massage as a potential solution. Massage both aggravate a problem like this by excessive pressure applied in the wrong location or help reduce symptoms and find resolution. How you handle this challenging situation is based on your proper understanding of the condition and ability to construct an effective and results-oriented treatment plan. Assmus H, Antoniadis G, Bischoff C. Carpal and cubital tunnel and other, rarer nerve compression syndromes. Dtsch Ärzteblatt Int. 2015;112(1-2):14-25; quiz 26. doi:10.3238/arztebl.2015.0014. Bozentka DJ. Cubital tunnel syndrome pathophysiology. Clin Orthop. 1998;(351):90-94. Dawson D, Hallett M, Wilbourn A. Entrapment Neuropathies. 3rd ed. Philadelphia: Lippincott-Raven; 1999. Vosbikian MM, Tarity TD, Nazarian LN, Ilyas AM. Does the ulnar nerve enlarge after surgical transposition? J Ultrasound Med. 2014;33(9):1647-1652. doi:10.7863/ultra.33.9.1647.